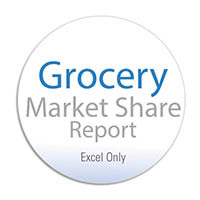 The Grocery Industry Market Share Report is a comprehensive database that measures the sales performance of grocery retailers and their competitors across 900+ Core Based Statistical Areas. For more information or to request a custom grocery research project call 1‑800‑927‑9292. Analysis of all 900+ CBSAs in the U.S.